Consider me a delinquent. I’ve been feeling rather ill lately and therefore less inclined to write, but I think I’m back up to 90% or so. Maybe even 95%. Last night I checked out the Sins Of The City tour with a few friends courtesy of the Vancouver Police Museum, so look for tons of very cool (and scandalous) photos later this evening. 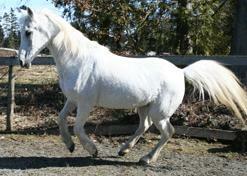 Once upon a time there were six horses who lived on a farm in Langley. Their names were Buddy, Magnum, Misty, Jock, Chewie and Lexie. One day, 911 received a call reporting a car in the ditch. Upon arriving at the scene, firefighters and RCMP were mortified by what they saw. A team from the BC SPCA and the Langley Animal Protection Society were called in because the crashed couple were forcing Buddy to tow their car out of the ditch. 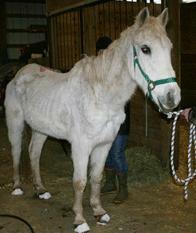 Buddy was too weak, in great pain and could hardly stand; he had to be euthanized at the scene. Magnum, Misty, Jock, Chewie and Lexie were found at the couple’s home in even worse condition. All five were emaciated, hypothermic and suffering from internal parasites and rain scald. Though the SPCA immediately brought them into special care and did everything they could, Magnum died a few days later. The good news is that through continued love and medical attention, Misty, Jock, Chewie and Lexie’s hearts and wounds have healed! Now in foster care (and awaiting their forever homes), the support given to these four beauties has made a 180-degree difference in their worlds. In 2008, the BC SPCA conducted nearly 5,000 cruelty investigations and removed more than 1,200 animals from dangerous home situations and neglectful owners. Each of these investigations costs an average of $10,000 from beginning to end (prosecution in Court). If you haven’t already done so, please consider sponsoring myself, Jordy and Charley as we pound the pavement (er, grass) in the 2009 Paws For A Cause to raise funds for animals just like Misty, Jock, Chewie and Lexie and countless others. Our goal for this year is $1,500 and through generous donations we’ve already reached 31% of that goal. Every little bit will help – whether you can give $3 or $30. Every penny goes to helping the animals! I am so glad there is an organization that helps out the animals in distress. I think people need to realize that the BCSPCA is not just there for dogs and cats. Aw, you angel…I went to visit them in the barn 2 days after they were taken into custody and could not believe my eyes, choked back tears and was almost afraid to pet them they looked so fragile…poor wee Magnum, but thank God the others made it. The most unbelieveable part of this story? The Owners were Veterinarians. There are no words. Yes, please everyone donate to my dear Kay’s fundraising efforts, she is an angel for the animals!! !